3. FX Reserves, The Dollar Crisis & The Outlook For Global Liquidity. I believe it’s only a matter of time before the Fed turns back on its printing presses. Until then, beware of falling asset prices. Stocks are bouncing today because the Fed will wrap up its monthly FOMC meeting and make a public statement this afternoon. Stocks have been rallying into FOMC meetings for the last three years, so traders are now conditioned to buy stocks in anticipation of this. The prime focus for the markets is whether the Fed continues to state that it will raise rates after “a considerable time.” The reality is that the Fed cannot and will not raise rates anywhere near normal levels at any point because doing so would blow up the financial system. Currently, the US has over $17 trillion in debt. The US can never pay this off. That is not some idle statement… we issued over $1 trillion in NEW debt in the last eight weeks simply because we don’t have the money to pay off the debt that is coming due from the past. Since we don’t have that kind of money, the US is now simply issuing NEW debt to raise the money to pay back the OLD debt. So the Fed wants interest rates low because it makes the US’s debt load much more serviceable. This is why the Fed keeps screwing around with language like “after a considerable time” despite the fact that rates should already be markedly higher based on the Taylor Rule as well as the state of the US economy: it’s all a ruse to pretend the Fed has a real choice in the matter. However, there’s an even bigger story here. $236 TRILLION IN "PROTECTIVE STOPS"
Currently US banks are sitting on over $236 trillion in derivatives trades. Of this, 81% ($191 TRILLION) are based on interest rates. Put another way, currently US banks have bet an amount equal to over 1,100% of the US GDP on interest rates. Guess which banks did this? The BIG FIVE: JP Morgan, CitiGroup, Goldman Sachs, and Bank of America. 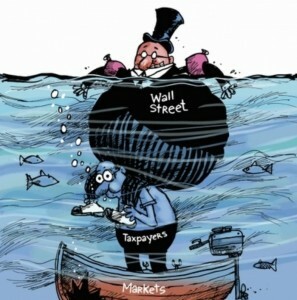 In other words… the Too Big To Fails… the very banks that the Fed has bailed out, and done everything it can to prop up. What are the odds that the Fed is going to raise rates significantly and risk blowing up these firms? Next to ZERO. Forget about the Fed’s language and its FOMC meeting. The real story is the $100 trillion bond bubble (more like the $200 trillion interest rate bubble based on bonds). When it breaks, it doesn’t matter what the Fed says or does.